Album info: Links to translated interviews and/or articles related to this album collected here. Maaya’s blog entry about this release can be found here. In regards to the title, “nikopachi” is a combination of two Japanese onomatopoeia, “niko-niko” and “pachi-pachi” or “pachiri.” “Niko-niko” is used to describe the expression of someone with a beaming happy smile on her face, and “pachi-pachi” or “pachiri” is used to describe the sound of someone clapping, blinking, snapping a picture, or punching. 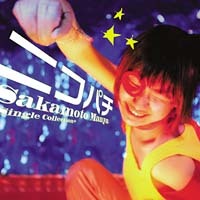 As you can see in the album cover, Maaya is both smiling and punching–nikopachi! Song info: From the 2002 Youko Kanno-composed album 23ji no Ongaku [11 p.m. Music] (original Japanese: ２３時の音楽), a soundtrack to the NHK serial drama “Mayonaka wa Betsu no Kao [The Other Side of Midnight]” (original Japanese: 真夜中は別の顔) where this song was used as a BGM. Song info: The word “kimidori” (meaning peagreen or yellowish-green) is meaningless, as it is code for Komadori, the name of the children’s theatre troupe Maaya joined as a child, and through which she got the work that led to her current career as a singer/voice actor/stage actor. Maaya wrote about her experiences with Komadori in an I.D essay, available translated by dillpops here: parts 1, 2, 3, 4, 5, 6, 7, and 8. Song info: From the 2001 Youko Kanno-composed Chikyuu Shoujo Arjuna [Earth Maiden Arjuna] soundtrack entitled Arjuna: into the another world. Song info: This song features Steve Conte and is a duet where he sings the main English vocals and Maaya sings Japanese in the background. There are no official Japanese lyrics for Maaya’s part, and while native Japanese speakers have attempted to transcribe what she is singing, because it is indistinct there are several possibilities for various spots in the lyrics and thus no way to create a definitive transcription, let alone English translation. Anything you find will not be accurate. zero gravity what’s it like? Translation notes:  The word “wagamama” in Japanese can mean both “selfish” and “my mom” depending on how it’s written; the lyrics create wordplay by writing it both ways. Song info: Created for, but never used in, Napple Tale. The main character’s name is Poach.